Have archaeologists found evidence of the Israelite hero Samson? The latest attempt at anchoring the Bible in “history” has come with the discovery of a small seal in Israel that purportedly provides “evidence” of the existence of the biblical hero Samson, renowned for his strength and heroism. The Jewish Hercules, Samson went on an unstoppable rampage, slaughtering the Philistines, but was done in by a woman, Delilah, who cut off his hair, the source of his strength. Have they sealed the deal on Samson? A team of Israeli archaeologists have discovered an ancient artifact which some believe may lend credence to the existence of the Biblical figure Samson. Excavation directors Prof. Shlomo Bunimovitz and Dr. Zvi Lederman of Tel Aviv University found a small, circular seal just outside Jerusalem in the Beit Shemesh tell in the Judaean Hills which supports Samson’s powerful story. The seal depicts a feline figure attacking a human, who sports what appears to be long hair. The piece was excavated in a layer of earth which dates to the 11th century, when the Jews were ruled by Judges, including Samson. Samson, as the Bible has it, maintained superhuman strength given to him by God in his long tresses. He discovered this power after killing a lion with his bare hands. This motif of a superhero killing a lion with his bare hands can be found in the story of the Greek god Hercules or Herakles, who is depicted in mosaics in this very posture – does the artifact below prove that Hercules existed? This Israeli seal does not show that Samson was a real person anymore than ancient artifacts showing the heroic figures of Hercules or Horus, etc., prove they were “real people.” There are thousands of such artifacts all over the world – actually, there are millions of images of various Indian divine figures, in practically every Hindu household, some dating back many centuries – were all those Indian gods and goddesses real people too? In my forthcoming book, Did Moses Exist? I examine closely the story of Moses and the Exodus, showing that various of its elements patently comprise ancient mythical motifs, many of which revolve largely around astral mythology/astrotheology and solar mythology. As part of this analysis, I examine also the origins of the Jewish tribal god Yahweh, as well as his relationship to other gods of the area such as El and Baal, along with their connection to the sun, via the Semitic sun god Shamash. As an example of how a sun god has been turned into an Israelite hero we can cite the story of Samson, written שמשון Shimshown, the first three letters and root of which are שמש or shemesh/shamash, the Semitic word for “sun” and name for the sun god. Indeed, Samson’s name means “like the sun,” and his story possesses a number of solar and soli-lunar elements, such as the tearing down of the two pillars of the temple, a solar motif likewise found in the myth of Hercules or Herakles, as is the tale of a lion killed by the hero’s bare hands. Another soli-lunar motif is the loss of strength when the sun god or solar hero’s “hair” is cut by the moon goddess, symbolizing the moon absorbing (and reflecting) the sun’s rays. The 1930’s gold coins featuring Liberty, and the Statue of Liberty, prove the existence of a woman called “Liberty”. They wouldn’t build a big statue anthropomorphising an abstract concept, amirite? Well the article did say that the object was merely being used to argue that the people living in the area at the time had a story about a man strong enough to fight a lion. As such, the article’s title- “Israeli archaeologists uncover seal lending credence to Biblical Samson’s existence” is very misleading. A better title would have been something like “Israeli archaeologists uncover seal shedding light on origins on Samson myth”. Of course such a title would likely be considered less sensational and interesting. Also I noticed there was some obnoxious Christian in the article’s comment section trying and failing to convert everyone there to a belief in biblical literalism. Indeed, the fact that the object was anonymous is very telling, since a long-haired hero depicted as slaying a lion barehanded is a generic motif for the near east that far predates the alleged time of Samson. 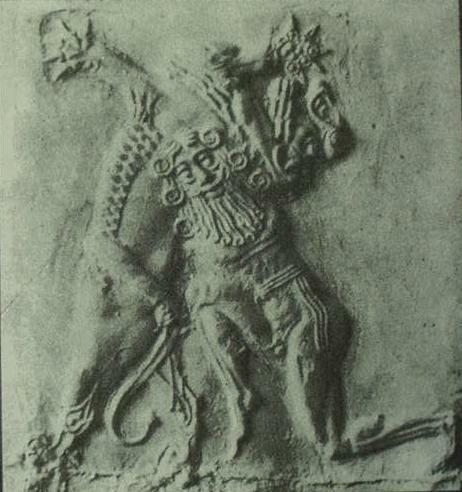 For example, the Mesopotamian tales of Gilgamesh involve Gil’s best friend, the long-haired Enkidu, doing the same (while Gil himself slays a bull- which reminds me of Mithras, interestingly enough, Christians used to depict Samson & the lion almost exactly like Mithras and the bull). Are so much more fun and interesting when they’re not literalized or historicized. Religion not only poisons everything, but makes everything so small, dismal and uninteresting. You can compare any legend to another between cultures. Odin is Zues who’s Allah who’s God, so to speak. Someone just found crendence to the fact those B*llsh*t stories have going on for a long time. Folklore to some. Didn’t some giant in American folklore walk around with a giant bull. The Greeks have a giant man with a bulls head. Howver, Troy was legend until they found it! If it’s in the Bible, that’s proof. Hahahahhahahahahahahaha!!!!! To me it doesn’t appear to be a lion attacking a man at all. It looks more like a horse eating something from the hand of a flat-chested woman. And the horse appears to be suffering from elephantitis! If Sampson isn’t real, Acharya, then who the heck is Samsu-Iluna, the 1750 BC King of Babylon? Sounds like he was the king of Babylon in the 18th century! And what has that got to do with Samson, the superhuman Israelite hero who supposedly lived during the 11th century? So close Acharya…so close. Yes, a Shamashshem is related to “a mun”….because a Shamashem is a Shaman. A “Wise One”..a Sol and Amun king (astronomer/astrologer/Watcher)…there were so many. Dig: Ptah is Buddha. Right down to the 1800’s BC statues in Egypt of a “Sleeping Ptah.” Right down to the Saqqara (Shaka Ra) “Hall of Kings” temple, with the Hall of Sokar (Shokar/Choiek) wall carvings of a seated Ptah, with Sokar and Amun standing behind him. ShokarAmen Ptah= ShakaMuni Buddha. You have seen the Kudduri stele, an astrological stone stele, with the image a “Houses” with a Harp on it? With the planet Venus over it? FOLLOWED by a House with a sun and moon over it? That is Istar’s House. SHE played the harp, soothed a giant blinded by Gilgamesh and Tai Sheba, her Storm God husband. Making HEr the Queen of (Tai) Sheba. And of course, you have read the Amarna letter from “Tushratta” (Dharitashtera, the famed PURU king, a Vedic Brahma worshiper..Abram), where he writes his “brother king” Amenhotep III about sending AGAIN a STATUE of Istar to Amenhotep guarded by “Shepas” (Sherpas?) carried on a litter as if a real person, to “cure what ails him” (impotence? Istar, the fertility goddess), ad what does the OT say happened? Solomon got “the Queen of Sheba” pregnant! Amenhotep III was Solomon. And in the Leipzig museum stands a statue of Amenhotep III…with Buddha’s big ears and wearing a Buddhist temple crown. Asian Eyes. A Shamasham…a Sol and Moon….a Shaman/Wise One. A SAKA/Shaka/Kaskas/Kassite/Hykosos king. Hint: I just went to a Tut exhibit in Seattle. I KNOW this is Solomon’s Treasure. His grandfather’s treasure. Amenhotep III’s treasure. Hidden by an Aten/Amun/Amen Cohen Gadol priest named Hezekiya/Hezekial (Google Mishnayot for details) from a raging Akhenaton/NebuKudduReYa/Nebuchadrezzer. There is much more….that 1400 BC 18th Egyptian dynasty? Oddly enough…the 1400 BC PURU dynasty has the SAME NAMES in king’s list. That fella named Yuya, that was Amenhotep III’s “non-royal” vizier and father-in-law? Hahaha, he is YUYU, the PURU INDIAN KING. That is why Amenhotep III refused a request for the hand of one of his daughters by a foreign king (Amarna letter) saying Egyptian kings never gave a daughter away to a foreign king…because marrying a PURU woman made you a PURU by birth. A Hebrew…a Jew…same as today, through the mother. There were over a dozen of them there “Moses” fellas…..
Oh yeah….”Ra” is Rama….Ra and Ma’at. Vedic in origin….Indian. Mother Cow/Hathor….and that “Star of David” is so obvious: That is..Istar Devatta…I Star Deva tta…Venus. Istar is Ester of the OT. She replaces the older, Eastern Vedic goddess…you noticed? “Ester” replaces a “queen”…both names start with a V….. so obvious…so astrological. Now for my shocker: I think the Hittites built Gobekli Tepe (check out the Hittite animals carvings and the ones at Gobekli Tepe…. looks like SAME artist)…and…I think the Hittites…were…..almost full-blooded Neandertal tribes. Call me crazy…but look at how they depicted themselves on wall carvings…then look at recreations of Neandertals…..imagining them in Hittite dress. Thank you. What I wrote, however, was not “so close.” It was accurate. Much of what you have written is unverifiable, but I concur that Esther is Ishtar. What a sermon. Can I have an “amen”? It’s all myth. Artistic depictions of “people” could represent almost anything … a tribe, a country, an army, an idea, a person, a people, an animal, a plant, etc. All these mythic beings change, morph, disintegrate, reintegrate, disappear, reappear. It’s all stuff in our minds, not “out there”. Can’t take too much of it literally. Literalness is almost always the problem, not the solution, to understanding these things. You take dawkins literally? Every word he utters is factual? You atheist sure are paying lots for freethought..with your souls! I think it is strange to say something like that. At those times people did not know that the light of the moon was caused by reflection of sun rays. They had no clue about our heliocentric solar system at all . They knew nothing about rotation of the earth axis , or planets circling around the sun and the moon around the earth . Even in the times of Mohammed it was common “knowledge” that the moon had light of it’s own , they absolutely did not know it was reflected light . So that is a timespan of 2000 years in which there was no real astronomical knowledge of whatever that happened up in the sky . It is even worse the heliocentric reality was only realized some 500 years ago . So all of a sudden 3000 years ago the boys who created Samsom’s myth knew about absorbing and reflecting sun rays ? That really puzzles me . There’s nothing “strange” about it. These myths themselves [i]prove [/i]that the ancients were aware of the sun’s rays reflecting in the moon. Let us not disparage their intelligence, please. Simply because the desert barbarians didn’t understand what the myths they were “borrowing” does not mean that the original mythographers likewise were ignorant. “Even in the time of Mohammed” is the Dark Ages, when this knowledge was evidently lost. The Near and Middle East is not the only source of culture, by the way, so declaring that “all” the ancients knew this or that is an exercise fraught with danger. Be sure to examine the writings of Indian scholars, who will contend that ancient Vedic sages knew the heliocentricity of the solar system, the precession of the equinoxes, and such relatively minor astronomical observations as the reflection of the sun’s light in the moon. As Acharya has written (and this is loosely paraphrased from dementia), peel those onion skins and layers all away and guess what you end up with … nothing. They’re just stories, just myth, probably with many origins and many purposes specific to the times they were written or not. There is no ultimate answer, meaning, origin, purpose in any writing. Never has been. Peel back atheism and you will find the truth. Acharya is NO source of truth. Paganism is alive and well in atheistic philosophy. Run little monkeys, evolving is taking place and you’re missing your turns! Keen, insightful observation, although not necessarily well documented, could not have been completely absent in the ancient world. Simply statistically, the human race seems to produce geniuses once in a while who have abilities of observation and reasoning far beyond the average. Therefore, it’s not out of the question that astronomical knowledge was gained and lost many times. I mean, seriously, it might not be much of a stretch that a very smart person, noting that the sun comes up and goes down every day, might also deduce that the moon’s light was actually the sun’s light, especially when it is waxing or waning. And, without the light pollution we have today, people must have naturally been more intimate with sky gazing than we are. Anyway, I can’t prove any of this, but it makes sense to me. Thanks. I’m not missing any points. Samson is clearly a solar myth, evidently based significantly on the widespread of worship of Hercules, regardless of what texts his story appears in. The character of Gulliver appears in a historical setting, but that fact does not demonstrate his historicity. Historical fiction has been composed since remote antiquity, as can be found in the Iliad, Odyssey and, yes, the Bible. Moreover, there are sites all over Greece, for one, where Hercules supposedly walked the earth. I’ve been to the site of Lerna, where tradition holds Hercules fought the hydra. Does that site make Hercules a real person? The point is not whether or not the coin and mural date to the same time or were found in proximity – that’s a strawman argument. The point is that Hercules is depicted in the same posture, and Hercules’s worship predates the supposed existence of Samson. If the coin represents a popular figure of antiquity, it could well be Hercules, not Samson. There is no evidence that any of the texts of the Bible was written down until many centuries later. Biblical scholarship today, such as by archaeologist Israel Finkelstein, suggests that the biblical texts were composed during the sixth or seventh centuries at the earliest. The story of Hercules was well known long before that time. Of course the picture of herakles fighting the lion doesn’t prove herakles existed. No one who is a critical thinker is saying the coin PROVES samson existed. But you are missing a few key details. The stories of Samson and the other judges are written not as a history (they are theological texts), but they are written historically (claiming that these events happened in real places, with real people, in real historical contexts). They make claims that they intend to be taken seriously regarding geography, chronology, sociology, etc… The same can not be said with the same veracity of the myths regarding herakles. With that context, there is a huge temporal gulf between the formation of the legend of Herakles (peisander plagarized the story in the 7th C BC i think)and the mural pictured above (the mural was found in spain and dates from around 250BC). The signifigance of the coin or seal found with “sampson” is that it dates (1100 BC) to so near a time that the story claims the events happened in (the period of the judges is generally thought to be between 1300 – 1050 BC). In addition, the coin bearing resemblence to the story of sampson was found in the near vicinity to location where the events are claimed to have happened. The mural above is hundreds of miles away. It would have been a better comparison to have found a mural of heracles nearer to Nemea. While not proving anything, it says that a story of a long-haired man fighting a lion was being popularized right around the time the book of judges says the event happened. Proof no, but evidence that the story of samson may be a historical event accurately recorded by a theological text – yes. Covering almost 19 000km², the Kruger National Park is comparable in size to the whole of Wales or Israel. It came into being in 1898 but was then known as the Sabie Game Reserve. Development came a standstill during the South African War, but afterwards the victorious British took up the reins again, tasking Major James Stevenson-Hamilton in 1902 with the responsibility of looking after the area. Stevenson-Hamilton, the first warden of the park, retired in 1946 after holding the post for 44 years. He is commemorated in the name of the park’s main rest camp, Skukuza, which is a Xitsonga word meaning “he who sweeps clean” and refers to his tireless efforts to control poaching. The warden worked hard to gain official status for the park, and in 1926 his efforts were rewarded when the government passed the National Parks Act and proclaimed the Kruger National Park, naming it after the president at the time, Paul Kruger. Stevenson-Hamilton was joined in 1902 by new assistant warden Harry Wolhuter, who famously survived an attack from two lions in 1904, armed with nothing more than a pocketknife. He killed the first lion with the weapon, and his dog kept the second lion at bay until help arrived. The knife and the lion skin can be seen in the Stevenson-Hamilton Memorial Museum at Skukuza. Killing a lion with a pocket knife? yes facts are sometimes stranger than fiction- so just don’t disregard the Biblical Samson story -as fiction. Thanks, but we don’t disregard the Samson story as fiction because his killing of a lion seems implausible. We consider it to be MYTH because it is clearly based on the Greek myth of Hercules, as well as other solar motifs such as the hair being cut by the moon goddess.